Description: I think the title of this work really fits. When I drew this design I was feeling convoluted. My mind was racing at warp speed as I was dealing with many issues in my professional life. 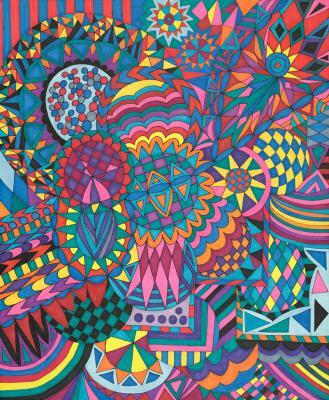 You will see in this drawing a wide variety of shapes without any real connection or specific purpose. As you look at this design, I hope you can appreciate the intricacies of it and give your mind a chance to wander. Some people have shared that they see life in this work; others see a rainbow and God�s promise; others see stars from the heavens. What do you see?